We’re in a time when traditional bricks-and-mortar jobs – especially the kind that pay a living wage and offer full benefits – are becoming increasingly scarce. At the same time, opportunities to make money online are increasing all the time. We may even be in a major shift in the occupational landscape, one of historic proportions. Just as workers went from farms to factories more than a century ago, and from factories to office suites more than 50 years ago, there may be a shift toward Internet jobs taking place in our own time. If that’s the case, where are the best job opportunities? When it comes to the Internet, there aren’t too many jobs, at least not as we traditionally define them. But there is incredible opportunity! That being the case, the question needs to be rephrased: where are the best income opportunities on the Internet? 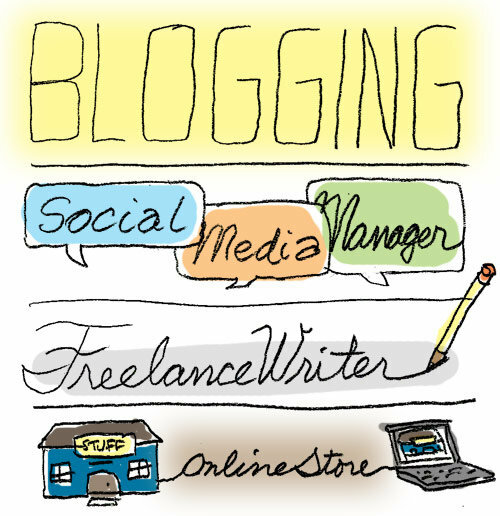 More people are making money blogging than ever before. However it is also true that more people are blogging than ever before, and most of them aren’t making any money at all. How do you join the ranks of moneymaking bloggers? Increasingly, the more profitable blogging opportunities are found in specific niches. If you are an expert in areas such as finance, credit cards, careers, insurance, travel deals, and even auto repair, the rewards can be rich. This is because these are areas that are wide open to advertising offers. And that’s what blogs run on – advertising revenue. The blogger establishes a site that specializes in a popular niche, draws a large audience, and is eventually approached by advertisers, who may want to either place paid ads on the site, or include the site in affiliate offers focused on selling their products and services. Blogging is becoming an increasingly specialized niche, so you have to do a considerable amount of research to find out what works. But all the research in the world won’t beat real-world experience! If you start a blog, you’ll have to be prepared to work with it for many months, and even a year or more, before you even start making money. But even if the blog doesn’t make any money, you may gain valuable experience and exposure, that will enable you to branch out into other opportunities. Some blogs function primarily to direct readers to the specific products and services that are offered by the blog owner. This can include financial services, e-books, or even specialized products and services. The whole concept of social media is relatively new, and the field as a potential career or business opportunity is still forming. But business and industry are becoming keenly aware of the value of the social media in drawing attention. Increasingly, social media is coming to be recognized as an advertising platform. If you are fluid in the social media, particularly Facebook, Twitter, and Google+, you may be able to provide paid services for a variety of businesses. The key is to be able to use the social media to draw attention to a website or a business. If you can, career opportunities are growing in the field. Not only is there demand for social media managers, but there are also some spinoff capacities, such as social media strategists and social media coordinators. Some of these opportunities may come in the form of a formal job, but they can just as easily be fulfilled either on a contract basis, or as a business-to-business service. If you’re good at social media you can make this happen. This is a way to make money online then I’m partial to, mainly because it’s what I do. If you like to write, and you are particularly well-versed in two or three common areas, there are opportunities to write for various blogs and other types of websites. Blogging was once a fairly simple affair, in which all tasks can be handled by the site owner, but the level of complication is growing. Many blog owners today spend most of their time creating and maintaining the site, and especially marketing it across the web. Most of their time is consumed on these tasks, so they will often subcontract out content creation to freelancers. A typical blog post runs anywhere from 600 to 1,000 words, and pays anywhere from $15 to $60 each, depending upon your skill and experience. If you’re just starting out, you can get your name out there by guest posting for free on popular websites. This will enable you to build up a portfolio of published work that you can use to actively solicit paying clients. One of the many advantages of freelance writing on the web is that you can do it on either a part-time or full-time basis. I started doing it as a side venture, but now it’s my main income source. You’re completely home-based, and you can work anywhere there’s an Internet connection. That opens incredible opportunities. This is one of the more challenging ways to make money online, but it is also one of the richest. If you have access to a product line, particularly one that you are very knowledgeable about, you will market directly online through a dedicated website. You can also offer it on an affiliate basis, in which you market your product on other websites, paying the site owner a commission on each sale. It’s always best when the product is very specific, fills a unique niche, and isn’t readily available at your friendly neighborhood big-box retailer. This is a highly specialized area, and if you plan to enter it you’ll need to do a considerable amount of research beforehand. A good place to start is Steve Chou’s website My Wife Quit Her Job. Steve and his wife are earning six figures per year, selling wedding handkerchiefs. Now there’s a niche if ever there was one – but that’s the basic idea. If you have solid web and internet-related skills, you can often find income opportunities by providing various services to established websites and blogs. This could include being a content manager for a blog, an SEO manager, a social media manager, creating YouTube videos, or even working with the more technical aspects of building and maintaining sites. People often learn these skills well before graduating from high school or college, and have more income potential than they realize. It’s likely that most of the blogs and websites available and coming online each year are started by people who have only minimal web and Internet experience. If your abilities are simply above average, you may have more potential clients than you could ever imagine. Inventory the skills you have in regard to both the Internet and with websites. If you are particularly good at one or two areas, you might want to market your skills directly to site owners, and see what turns up. If you can do well with a small number of sites, you can get enough referrals to keep your business going on an ongoing basis. One of the biggest advantages of making money online is that the Internet is in a constant state of flux. That cycle of change creates an almost limitless number of opportunities. Making money online is often just a matter of matching your specific skills to the current market demands. The best course, very often, is to go for it and see what happens. My guess is that you’ll be pleasantly surprised at what you find. Are you making money online? What could you suggest to others who’d like to do it too? Thanks for sharing such a innovative ways to make money online. Looking forward to use one of the way to earn good money. I am convinced my blog will never make money but it keeps me honest with my money. I see my blog giving me a platform so that I can be heard and hopefully gain some freelance writing jobs from it. I just have to find time and energy to do this after I work my full time job and occasionally clean my house. All great ideas here, Kevin. Freelancing has been huge for me because I love to write and because it comes so easily to me. It really is a great way to do what you love and make money at it too! Hi Laurie – That hits on an important point. The web has enabled us to take what we like/love to do and to monetize it. That opportunity may be something that has never existed before. Just look at the opportunities to deveop or promote a career or business idea: the social media, a blog, YouTube videos, affiliate marketing, online businesses, networking, global buying/selling – there’s room in there for just about anyone to take an idea and run with it. Kudos to you for doing just that! I’ve gotten into affiliate marketing to try and make money online. Being new to the marketing aspect of being online I figured it was the easiest approach…market a product, receive commission. Of course it’s easier said than done. I’ve made a little over $1,300 in just over a month, so not too bad for my first go at it. Any money made is put back into traffic/lead generation and the cycle continues. Once I make an amount I’m comfortable with I’ll be able to start paying myself. I had a blog a long, long time ago, maybe made $50? It ended up being hacked and blacklisted by Google so I shut it down, it took awhile and a lot of effort to get it noticed before it was hacked. If you have the patience then go ahead and blog, it’s fun to do and if you’re passionate about your niche you’ll love it even more. I highly suggest affiliate marketing if you want to make money. You technically don’t even need a site… send targeted traffic (paid is best) to the product and reap the rewards. Hi Sean – That may be the area of blogging (affiliate marketing) that requires the most expertise, but once you gain it, you’re on your way. Of course, it usually doesn’t work unless you have a fairly large traffic flow. I’m curious, did you earn $1,300 in your first month, or is that for your most recent month. It’s not usually possible to make that kind of money right out of the gate. If you did, then you need to be conducting paid seminars and workshops to cash in on your deep inside knowledge. An ebook or online course wouldn’t be a bad idea either. The $1,300 was my very first month, although I’ve invested much more than that into the business. So, while it’s nice, it’s not a profit…yet. That being said, I’ve been running solo ads and advertising on various sites, as well as doing more personal engaging on social media sites. I’ve done PPC on Facebook but that hasn’t really gotten me anywhere. The program I’ve joined/promote has an amazing training course and personal coaches, so I really don’t have much inside knowledge, I’m simply driving traffic to a great program with large commissions, plus giving away free bonus offers leveraged through one of the internets big names. So far it’s going good! I finally decided to start a finance blog, because it’s a way to make money online, but more importantly, it’s a blast! Blogging is not something that will earn you money overnight…or even overyear in most cases, but eventually, if you keep going, it can be a great source of semi-passive income. I completely agree Kalen, I think you have to take the long view when it comes to blogging. I’ve known of some bloggers who gave up their blogs to pursue bricks and mortar opportunities, but I’ve always thought that’s a strategic error. The web really is the information super highway, and we all need have a little corner somewhere on it to take advantage of what ever it may bring. I’d rather have an established blog than to have to start a new one from scratch. At a minimum, keep it on life support while you do something else, but keep it going no matter what. While the income I make off my blog is sporadic and certainly not enough to live on, my blog has served as a kind of active online portfolio of my work, helping me get all kinds of other work from virtual assisting to freelance writing. Hi Stefanie – That’s the lesser known B side of blogging – that it generates other business opportunities for you. Most blogs don’t make money, but if they create opportunities for you, then it’s basically the same thing, just a different path. When I was in business school in 2006 they already had a class on social media. So for me it’s been around for almost a decade. I guess it’s now being call a “Social media” manager. However, the concept of it was not new. I grew up with computers, so the thought of making not making money from internet never existed. In high school I was already on eBay. Now I am a reputable seller on eBay. You are right though about being knowledgeable. It takes a considerable amount to get niched and or specialized. I didn’t go to school for computer science, but because I sell on eBay I taught myself HTML coding. So I can customize my templates. There are so many ways to make money online it’s amazing! I started as a live medical interpreter. Now I see clients across the country via webcam. I no longer commute and I have flexibility that I could have never imagined. Hi Allison – You’re the classic example of someone making money online simply by being creative. That’s really the best way, since there is no standard way to do it anyhow. I think you start by assessing your strengths, skills, talents and passions, and see how you can make money online. For what it’s worth, HTML was a self-taught experience for me as well.